In June and July of this year, people around the world watched the news for updates on the Taiwanese soccer team trapped in the Tham Luang cave system. A heroic rescue effort finally saved them all, despite one of the rescue divers losing his life while preparing for the mission. Exploring caves is an exciting, but very dangerous adventure. What many local people may not realize is that Nova Scotia's largest cave is located in Baddeck Cape Breton. It's the Arch Cave, formed from gypsum. 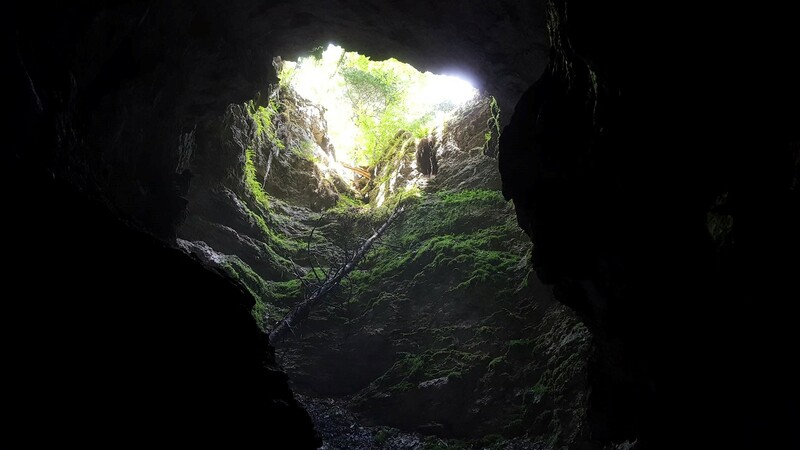 The photo above shows a sinkhole that collapsed into the cave from the forest above. The video below shows an exploration that includes crawling through a passageway that is only about one foot high and just wide enough for an average-sized adult to pass through. People who don't like to be in confined spaces certainly would not want to traverse this cave's narrow passageways.